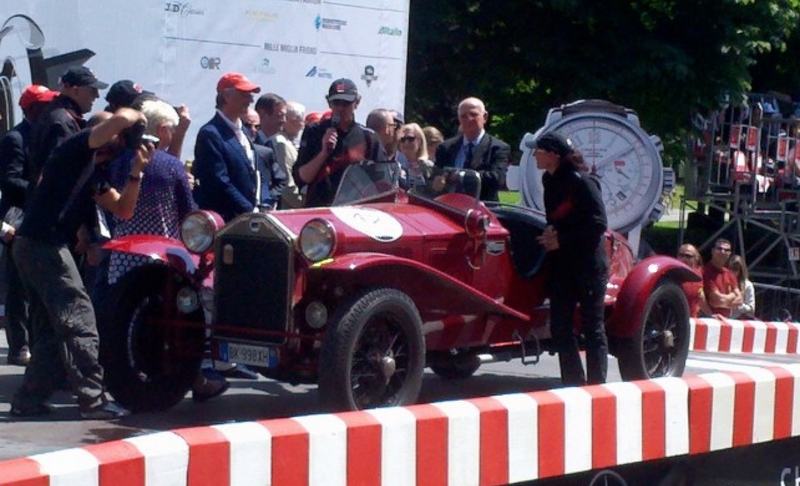 Giordano Mozzi & wife Stefania Biacca celebrate winning the 1000 Miglia 2014. 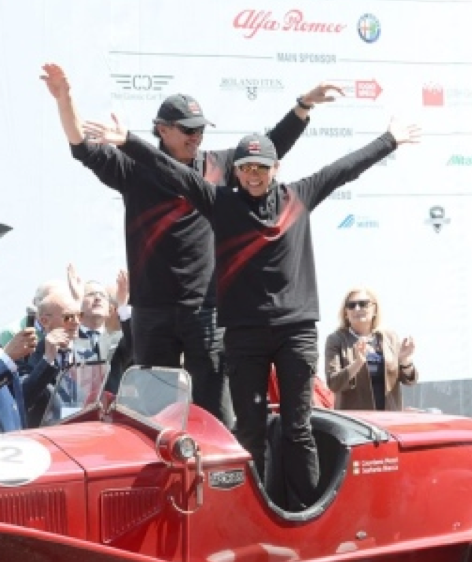 Giordano Mozzi, with his wife Stefania Biacca alongside as his navigator, drove his 1928 Lancia Lambda Tipo 221 to victory Sunday in the 2014 edition of the 1000 Miglia. The event celebrates the historic Mille Miglia road race, which was run 24 times on Italian highways (that remained open to the public) between 1927 and 1957 – until being stopped for safety concerns. It starts in Brescia and goes to Rome and back over much of the original course, through four festive days that bring much of northern Italy to a stop to celebrate it. The 1000 Miglia features pre-1958 cars that would have been eligible to run in the original race. It attracts hundreds of entries from around the world, with a vast array of immaculate classic cars, and a fascinating lineup of drivers. Timed sections at various closed-course sessions determine the winning points. This year’s field included entertainer Jay Leno paired with Jaguar designer Ian Callum in a 1951 XK120. Actor Jeremy Irons also competed, as did several auto industry executives like former Tata Motors CEO Carl-Peter Forster, designer Andrea Zagato and former grand prix racers Jochen Mass, Jacky Ickx, Martin Brundle and Bruno Senna. « Finding Cannon Ball’s Trail: The Riders Arrive In NYC!